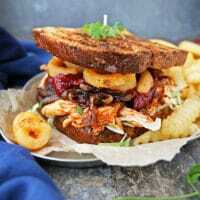 This piled-high, layered, Sweet Spicy Chicken Fries Sandwich is a messy sandwich – one you will need a plate for! 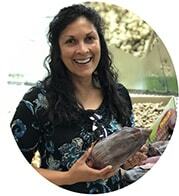 But, it sure is blissful taking a big bite of all the mingling textures and flavors of those different layers! But I do know that no matter what the sport season may be, there are always game day potlucks at friends’ homes. And, game day potlucks mean game day food ~ oftentimes with a plethora of McCain® products!!!! And, somehow, I manage to remember what I feasted upon on said game day potlucks! BTW, until 5/31/19, you can get $1.50 off when you purchase 2 participating McCain products at Walmart. You can submit your rebate & learn more details here. And, speaking of game day feasting, there always seems to be an abundance of burgers and sliders at those game day potlucks I’ve been to. From vegan chickpea potato patties to double decker cheese sliders, burgers always seem to be center stage. But, sandwiches… those piled-high, sure-to-wow-your-guests, messy sandwiches that demand two hands (and maybe even a bib), hardly ever make the game day potluck table! So, today, I would like to share my contribution to the next game day potluck I attend: this Sweet Spicy Chicken Fries Sandwich. I picked up all the ingredients for this sandwich at my neighborhood Walmart. 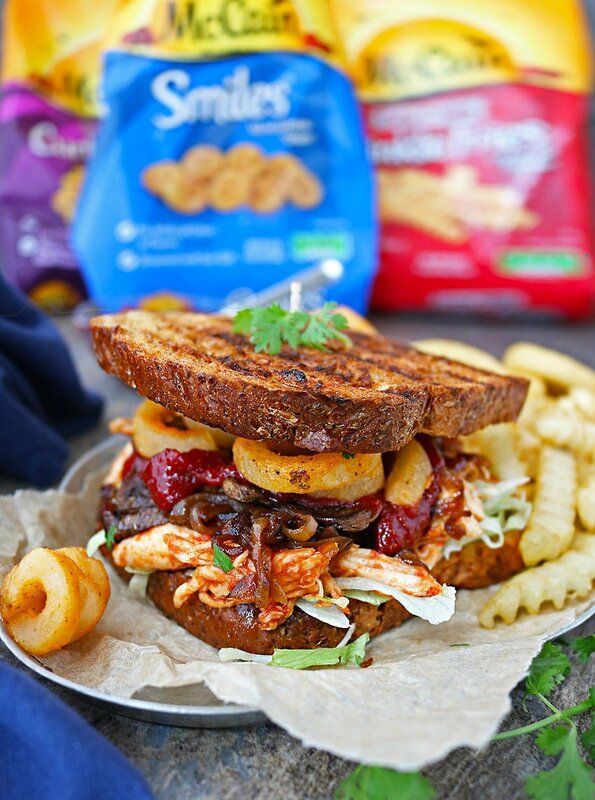 This piled-high Sweet Spicy Chicken Fries Sandwich has shredded lettuce, tender shredded chicken (that was marinated and cooked in an easy sweet spicy sauce), caramelized onions, crispy mushrooms, McCain® Seasoned Curly Fries Seasoned Potato Fries, and McCain® Smiles® Mashed Potato Shapes. All piled between two toasted or grilled slices of bread! Now, this is a messy sandwich – one you will need a plate for! 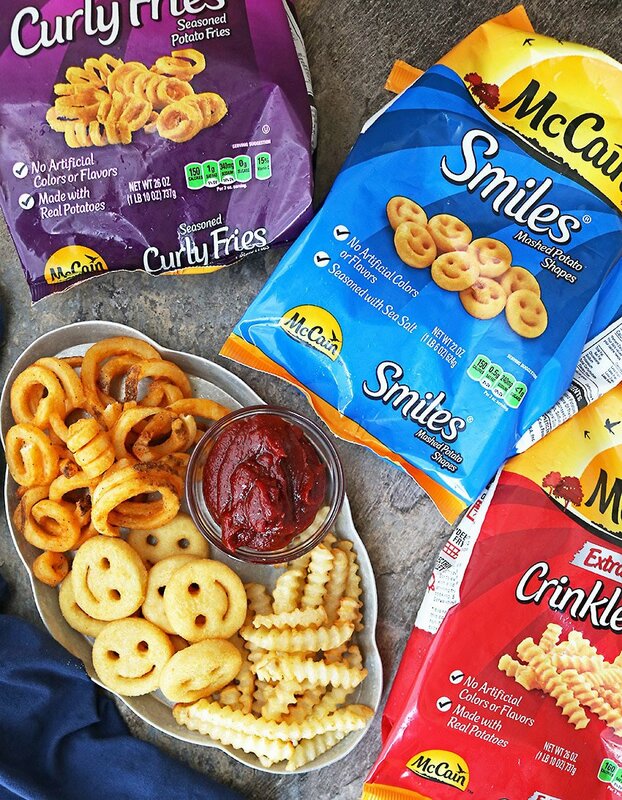 But, all those mingling textures and flavors… AND McCain® Seasoned Curly Fries Seasoned Potato Fries and McCain® Smiles® Mashed Potato Shapes… ALL in each, messy, bite! Ahhh… BLISS!!! All kidding aside though, on my trial run, this was one super easy, tasty, and just plain fun, sandwich to pull together. 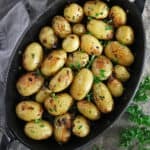 I think a potato platter potluck needs to be the theme of one of our game day potlucks – whad’ya think? 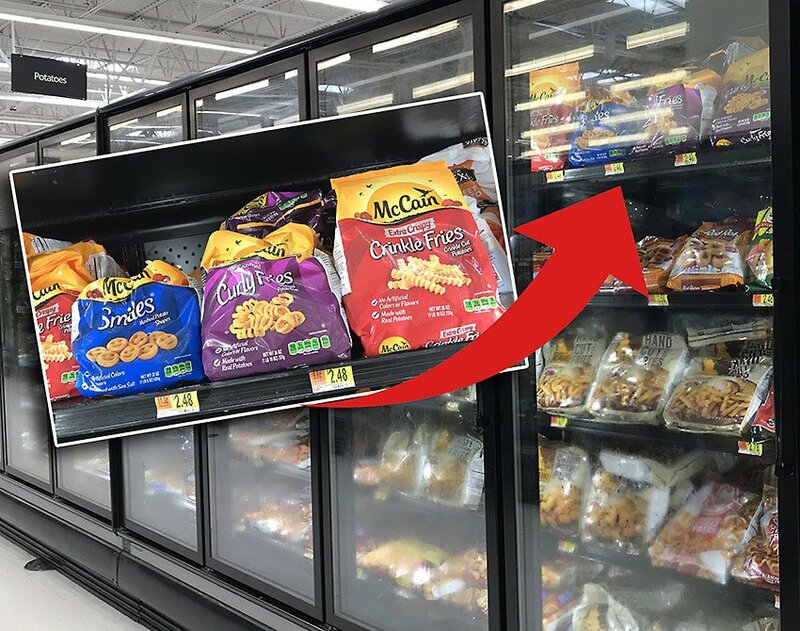 If you grab some McCain® Craft Beer Battered Thin Cut Fries at your local Walmart, load them up with toppings to serve up. Or, add a burst of flavor to your menu with McCain® Seasoned Curly Fries Seasoned Potato Fries. Keep things fun with McCain® Smiles® Mashed Potato. 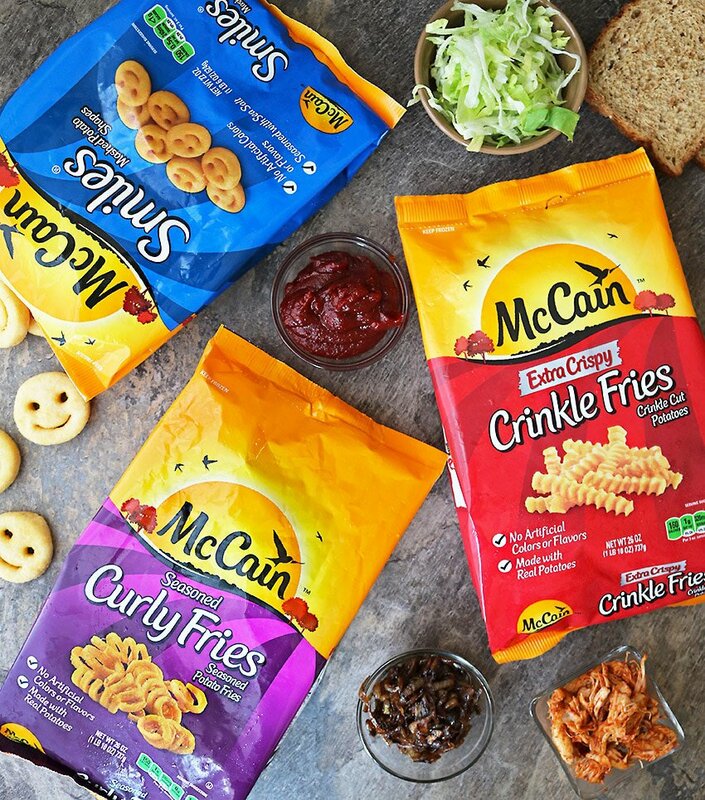 McCain® products are equally great for dipping and layering! Don’t forget to take advantage of this rebate offer mentioned above and why not give this piled-high, messy sandwich a try? 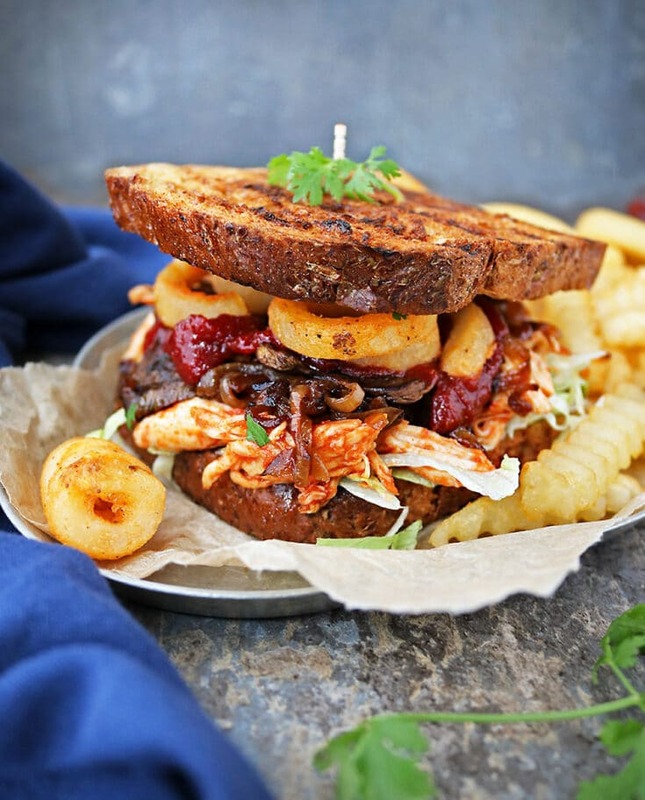 This piled-high, layered, Sweet Spicy Chicken Fries Sandwich is a messy sandwich – one you will need a plate for! 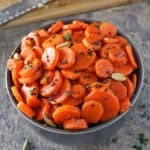 But, it sure is blissful taking a big bite of all the mingling textures and flavors of those different layers ! Add honey, tomato paste, apple cider vinegar, chili powder and cumin to a saucepan over medium heat and whisk well until all ingredients are mixed well - for about 3 to 4 minutes. Remove from heat and season with salt and pepper to taste and set aside. Prepare the chicken tenderloins by marinating them in 2 tbsp of the Sweet Spicy Sauce first. 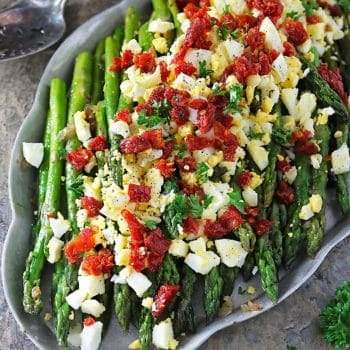 Then cooking them covered in a pan with a tbsp of olive oil - cook them on one side for 4-5 minutes, then flip and cook on other side for 4-5 minutes too. 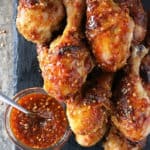 When cooked, shred chicken and set aside. Caramelize onion by sauteing a chopped onion over a medium/low flame in about 2 tbsp of olive oil. It will take about 15-20 minutes of stirring before onions are evenly caramelized. When done set aside. 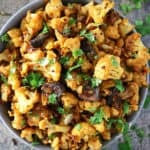 Crisp mushrooms by adding them to a pan with 1 tbsp olive oil and cooking about 7 minutes on one side. Then flipping and cooking another 7 minutes on the other or until golden brown and crisp on both sides. Prepare McCain® Seasoned Curly Fries Seasoned Potato Fries and McCain® Smiles® Mashed Potato Shapes according to package directions. Toast/grill 4 slices of bread. Add on a 1/4 cup each on each slice. Top with other slice of bread and enjoy with more McCain® Extra Crispy Crinkle Fries on the side! Oh my, that is one dirty sandwich and I like it!!! This is absolutely fabulous! So tasty and satisfying! I can’t wait to see my family’s faces when they see what’s for dinner. They are going to go crazy over these. So good! The chicken sandwich looks droolworthy! 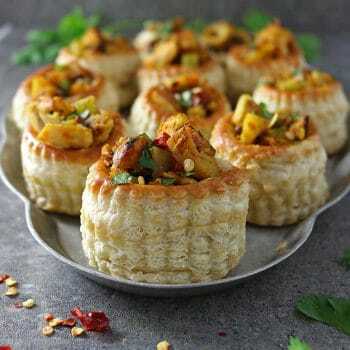 Sweet and spicy are wonderful flavours together. Wow! What a fun and unique sandwich! This sounds delicious; I can’t wait to make it! Fries are my favorites! This sandwich is mouthwatering! Looks amazing. Just need a bite, please! Oh, these sandwiches are calling my name for sure, Shashi! I love fries on sandwiches, but I don’t think I’ve ever made a homemade version. And that sweet + spicy shredded chicken would be awesome with the crispy fries on top. I bet Robbie would love that smiley face fries, too. I’ll have to grab him a bag this weekend on our Walmart run! (That rebate is a great deal!) Thanks for sharing these yummy eats, my friend! I don’t know much about sports either, but if I did these sandwiches would definitely make me forget the game. Talk about piled high – love it!!! And fries on there? What a brilliant idea, Shashi! 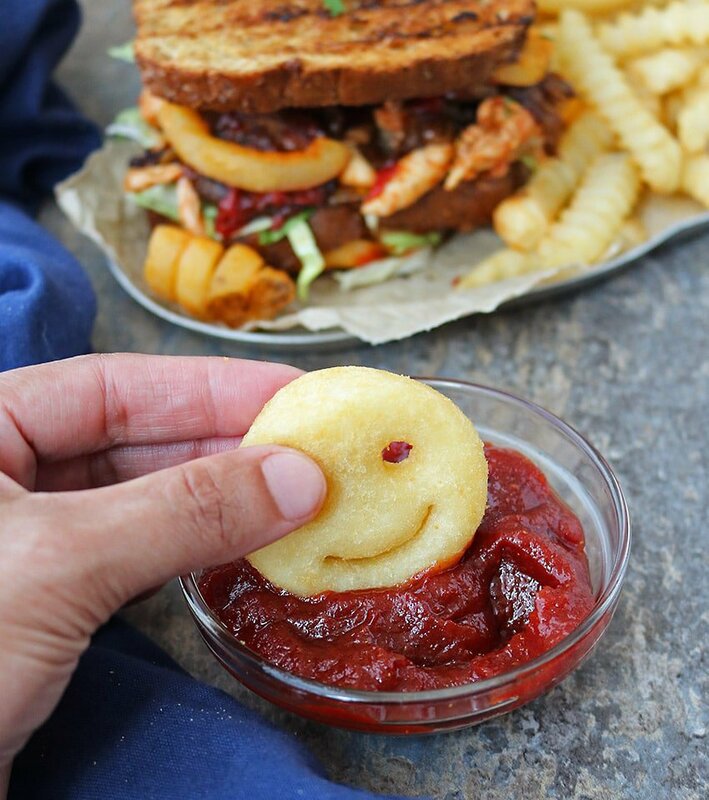 Those smile fries always puts a smile on my face 😉 You’re seriously making me hungry right now! I believe you’ve just made THE most appetizing sandwich I’ve ever seen. I’m not huge on game days, but the only reason I ever do go is for the food! 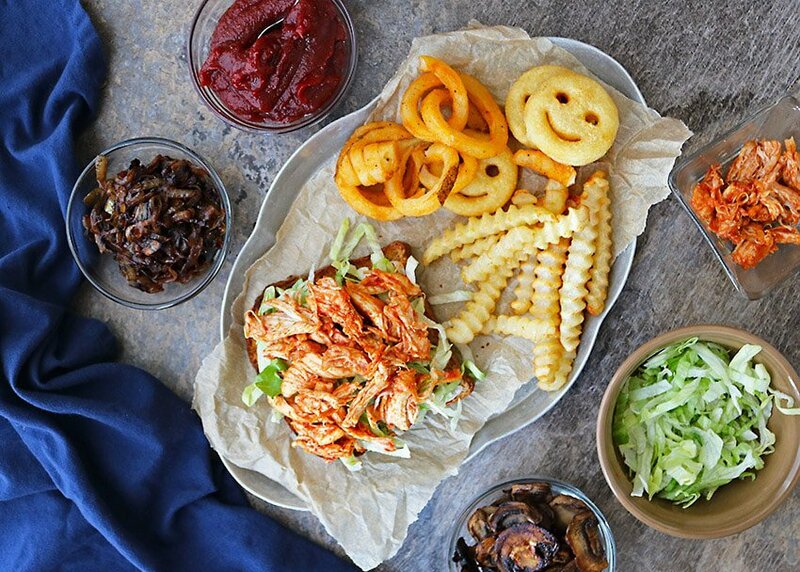 I know someone who would *love* this sweet & spicy chicken sandwich, especially with those fries stuffed inside! Wow, whatta sandwich! Incredible flavor packed into this — and all the different textures. Fun stuff — thanks. Loving your sweet spicy chicken fries sandwiches Shashi. This is fantastic comfort food at its best. Lady Lynne said she cannot wait until I make these! Ha ha!